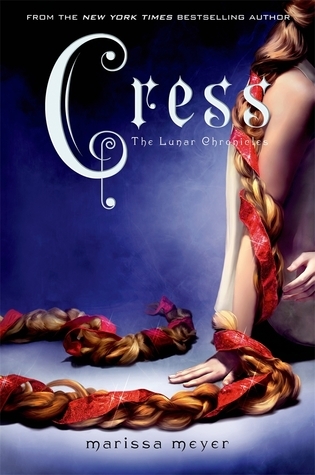 Cress is the third installment in the Lunar Chronicles by the magnificent Marissa Meyer. So if you do not want spoilers for the previous books please skip this review. We are introduced to our new fairy tale princess respin, Cress. AKA Rapunzel. She has been locked up on a satellite for 7 years with no communication to the outside world, except for her mistress. She has been working for Queen Levana without a choice. Her excellent hacking and tracking skills leads her to Cinder and Thorne. Of course she knows all about Thorne from his previous history and already has a schoolgirl crush on him. Can we say we blame her? As Cinder and Thorne rescue Cress from the satellite things go haywire and the team is split up. They have to find their way back to each other and make a plan to stop Levana. This books was by far the best in the series yet. The other two was meh. Pretty good, glad I read them. This one though had me really drawn into the story from the beginning. All of the old characters are still loveable and little annoying (looking at you Scarlet and Wolf). Cinder just keeps getting more likeable to me. So does Kai. Their relationship is a little better in this one. They have quite confusing feelings for each other. Iko is still funny and adorable. Thorne is still my favorite character. I love his personality and his will to do whatever it takes. His honesty and vulnerability to Cress shows how unexpected their relationship ends up being. It isn’t instalove, which is great! I felt like everyone else’s was so rushed. Cress and Thornes is simmering and it is just wonderful. Levana is even more ruthless that ever. There are literally tons of different POVs in this one but still done well enough where it did not get confusing. The different things we have going on and the world building was a little better this time around. I liked the journey through the Sahara desert and Africa. There were a couple of plot twist that I didn’t see coming but it wasn’t so overwhelming that it overtook the rest of the things going on in the book. The wedding is still being planned (poor Kai.) Cinder is bound and determined to stop this wedding. Which is the right thing to do. She needs to save Earth and her beloved. Everyone says this series gets better with each book. So far, so true. I am a little afraid of Winter. We see just a glimpse of her towards the end and she seems a little on the crazy side? Guess we shall see. The narrator was for sure less annoying in this one. I think she done quite brilliant with all the different accents. Great review! I’m happy to hear you enjoyed this one more than the previous installments. I hope you really enjoy Cress!